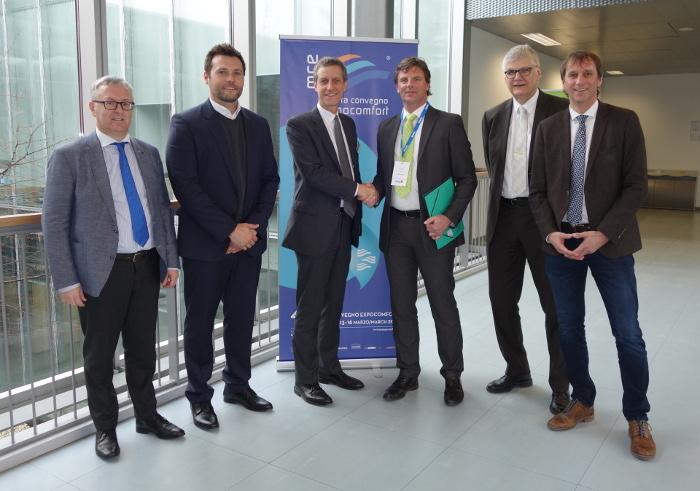 On Thursday, 15 March, DVGW CERT GmbH and Kiwa Nederland B.V. signed a Memorandum of Understanding (MoU) which stipulates a common voluntary assessment scheme for plastics multilayer piping systems for hot and cold drinking water inside buildings. The voluntary certification scheme aims to harmonise country specific certification schemes and thus reduces the testing, audit & certification efforts for the manufacturing industry. The scheme is open and all individual European certification bodies and their associated test houses are invited to join. By signing the MoU, DVGW CERT GmbH and Kiwa Nederland B.V. registered their schemes as a start of the voluntary assessment program in Europe in the area of multilayer piping systems. The signing of the MoU at the Mostra Convegno trade exhibition in Milan is the formal kick-off to realize a transparent and harmonised certification scheme for plastics multilayer hot and cold drinking water pipe producers. The project was initiated upon request and in close cooperation with TEPPFA, the Brussels based European trade association of plastic pipe and fittings manufacturers. From left to right: Ludo Debever (General Manager, TEPPFA), Dragan Jovanov (Head of Business Sector Water & Gas, Kiwa Nederland B.V.), Joachim Rau (Managing Director, DVGW CERT GmbH), Ing. Ronald Karel (Managing Director Energy, Water & FFS Products, Kiwa Nederland B.V.), Anton Wohlgemuth (Team Leader Products Water, DVGW CERT GmbH), Horst Stimmelmayr (REHAU AG &Co, TEPPFA representative). For more information, please contact Mr. Leo van Driel: Leo.van.Driel@kiwa.nl, phone +31 88 998 4484.